Cooking is love made visible! What a sweet gift for Mum on Mother's Day! 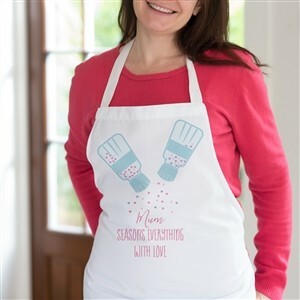 If you're lucky enough to have a mum who loves cooking up all manner of lovely treats for you in the kitchen, why not treat her with this cute apron? A lovely white apron that loops over the neck and ties at the back. One size to fit all, designed and printed for you when you order in our studio on the Isle of Wight.